A full-time farmer manages the garden using sustainable practices in harmony with the living process of the soil. No synthetic or chemical pesticides or fertilizers are used. Organizational responsibilities are over-seen by a Core Group of volunteers. 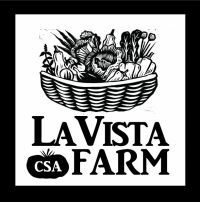 Shares of the harvest are sold to area families and individuals who are interested in obtaining fresh produce and who support the principles of Community Supported Agriculture. What’s included in a Share? On average, a weekly Share provides two adults with a vegetable-loving diet or a vegetable-supplemented diet for a family of four. What should I bring to my first pick up? Since you weigh out your own produce, it is helpful to bring your own basket, containers, bags, ziplocs, rubber bands, scissors, pruners, etc... Also, bring a bottle of water, a sun hat and sunscreen for the you-pick field. The season starts mid-May and goes through October, depending on growing conditions. How is the produce distributed? We also offer a St. Louis pick-up option at Garden Heights Nursery every Saturday morning from 7:00am - 9:00am. 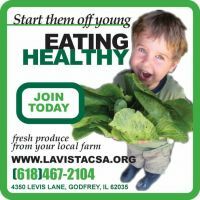 We offer an Edwardsville pick-up option at Green Earth Grocery every Tuesday evening from 5:00pm - 6:30pm. Please note that there is a delivery fee of $35 for either delivery option. What is the "community" aspect of the farm? Shareholders are asked to volunteer three hours a month to support the “community” aspect of the garden. A wide range of volunteer activities are needed and include both outside farm work and "behind the scenes" work. Some of our volunteer tasks include planting, weeding, harvesting, farm maintenance, and grant-writing, membership support, publicity and website maintenance. "Full" shareholders pick up their shares every week. "Alternate" shareholders pick up their shares every other week. The weeks are assigned at the beginning of the season. At the Farm, shareholder pickup days are Tuesdays and Fridays. Pickup times are between 2pm and 7pm. At Garden Heights Nursery in Richmond Heights, shareholders pick up on Saturdays between 7am and 9am. Please check your inbox regularly for important announcements regarding your share.